Inbound marketing is a web marketing methodology that is education-based rather than interruption-based. It's focus is on creating and distributing valuable, relevant and consistent content to attract and retain a clearly defined audience – and, ultimately, to drive profitable customer action. Inbound marketing is a methodology that is education-based rather than interruption-based. Its focus is on creating and distributing valuable, relevant and consistent content in order to attract and retain a clearly defined audience. This, ultimately, drives profitable customer action. Similar to content marketing, inbound marketing is the overarching strategy of combining several web marketing disciplines (including content marketing) with integration tools, measurement and lead generation. We’re all familiar with interruption marketing; it comes in the form of TV commercials that interrupt your programming, phone calls that interrupt your family dinner and pop-ups that interrupt your online browsing. Interruption marketing is expensive, annoying and doesn’t earn you loyal customers. Inbound marketing, on the other hand – when done right – serves to attract, convert, close and delight your desired audiences by delivering to them relevant and personal content that is driven by their needs, on their timelines. During this phase, website optimization, blogging and sharing content on social media are the main focuses. These content vehicles work to let people know you exist, share your unique message and build the know–like–trust relationship. Once you’ve attracted people to your website or blog, you can begin to influence them with relevant content. Your website has one goal: to capture a lead. To do so, your content should focus on solving your visitors' problems. 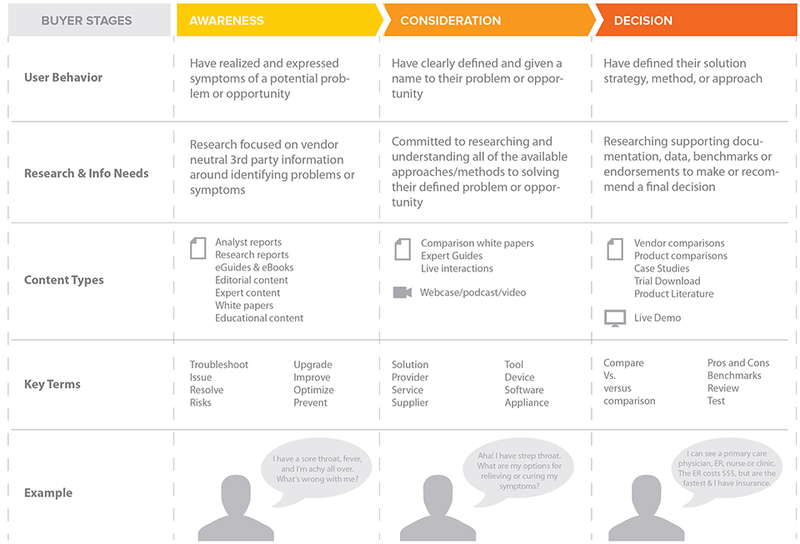 To provide a solution, you must know their problems, which you discovered during the research phase prior to creating your content. 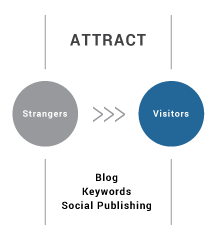 Once prospects arrive at your site, you need a conversion process with a strong call to action that encourages them to leave their email address. This is critical. Without this, you may never know what opportunities you’ve missed and you’ll have wasted time and money in getting those visitors to your website. 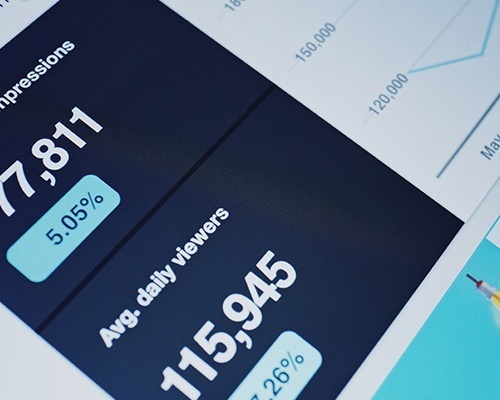 Once you’ve attracted people to your website and converted them into leads using quality, targeted content, your content focus turns to the close. The best and most important content tool available is email. According to Hubspot, email has a return on investment of 4300 percent. By sending prospects likeable, lead-nurturing content via email, you can continue building the relationship and advance the sales cycle. You can optimize successful email campaigns to provide further value to your customers and help them do their jobs better. 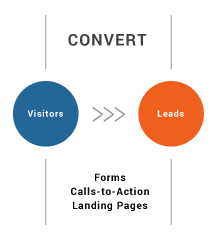 With inbound marketing, your No. 1 priority is serving people. 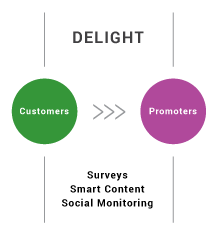 When you focus on serving your customer throughout each phase of the inbound methodology, you build trust. Building trust is core to delighting your customers and creating lasting relationships. Once you’ve established a client relationship built on trust, you can continue to market new products and services indefinitely. At Axia Public Relations, we help clients build inbound marketing strategies to attract, convert, close and delight customers. We do the hard work to research your buyer personas and create the required content and content vehicles that will turn prospects into leads and close deals. Give us a call today to discuss how we can help you get started with an inbound marketing strategy for your company. 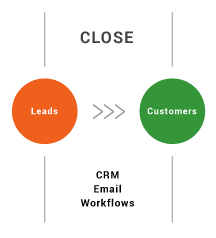 The inbound methodology covers each and every step taken, tool used and life cycle stage traveled through on the road from stranger to customer. It empowers marketers to attract visitors, convert leads, close customers and delight promoters. The new methodology acknowledges that inbound marketing doesn’t just happen, you do it – and you do it using tools and applications that help you create and deliver content that will appeal to precisely the right people (your buyer personas) in the right places (channels) at just the right times (life cycle stages). Ready to get started with this service?